Looking back to eight decades of style, LACOSTE pays tribute to the inventiveness of its founder and to its history by reissuing a selection of polo shirts and emblematic items from its archives to celebrate its 85th Anniversary. Like the pages of a souvenir album, this anniversary collection offers an opportunity to rediscover the multiple facets of the LACOSTE style which, since its creation, has proven its ability to play with fashion codes and innovate over time without ever departing from a timeless and modern elegance in keeping with its DNA. This capsule collection consists of 15 reissues – eight unisex polos, three dresses, a pair of shoes and three bags. Reflecting 85 years of creativity in their graphic design, materials and shapes, these items take on contemporary colours borrowed from the Spring/Summer 2018 range and give new life to the legendary “La Chemise LACOSTE” label. Each period has its own style. Inspired by the prototype preceding the invention of the iconic L.12.12 polo shirt designed by René Lacoste in 1933, this close-fitting cotton interlock polo has a cut-and-sew collar, a folded placket, a patch pocket on the chest and sleeves slightly longer than those of the current L.12.12 polo shirt. This model comes in ecru, navy blue or red. 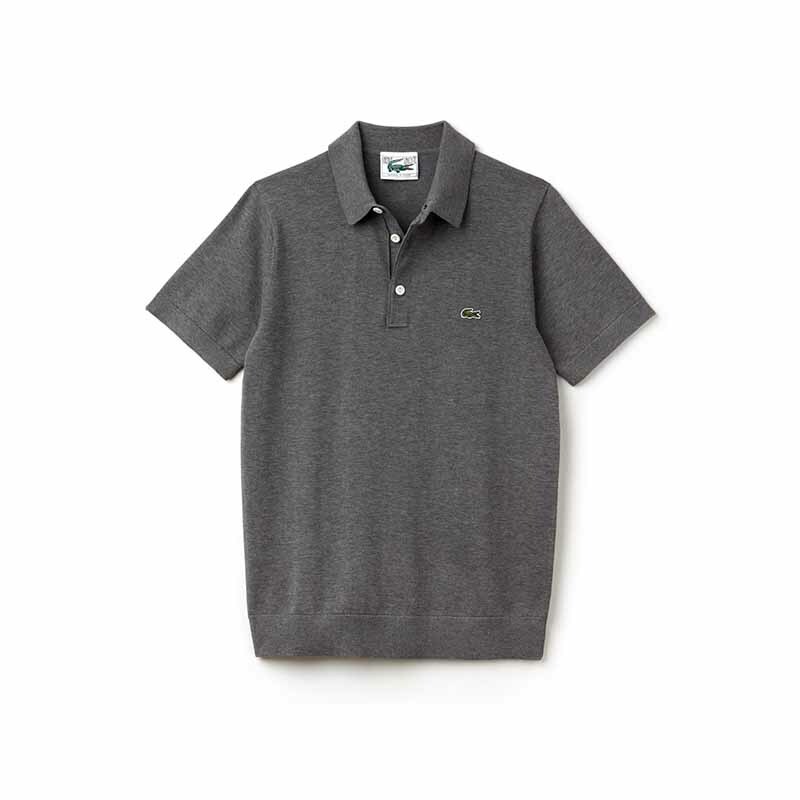 Featuring a collar stand, this mottled anthracite jersey knit polo outlines a resolutely chic and relaxed silhouette. Created by combining a polo shirt and a sweatshirt, this vintage sports garment with a single-rib collar comes in green crepe fleece embellished with double ribbing at the cuffs and hem. Navy blue and white are the key colours for this fully buttoned petit piqué polo shirt, the hem and collar of which are enhanced by piping, and for this backless V-neck tennis dress with pleated hem. True to its original design, the famous “René” canvas tennis shoe is also revisited in three versions: navy blue with white piping, white with navy blue stripes and two-tone white and red. Wide decorative bands adorn a colour block polo shirt and polo dress in white, navy and red cotton interlock. Also available in white, navy and grey blue, the polo shirt comes in children’s sizes. The advent of the sailor top inspired this cotton piqué polo shirt trimmed with a navy blue and white striped shoulder yoke and a white collar. For women, a white petit piqué polo dress with collar and sleeves delicately highlighted by two-tone edging has an elastic waistband for added femininity. 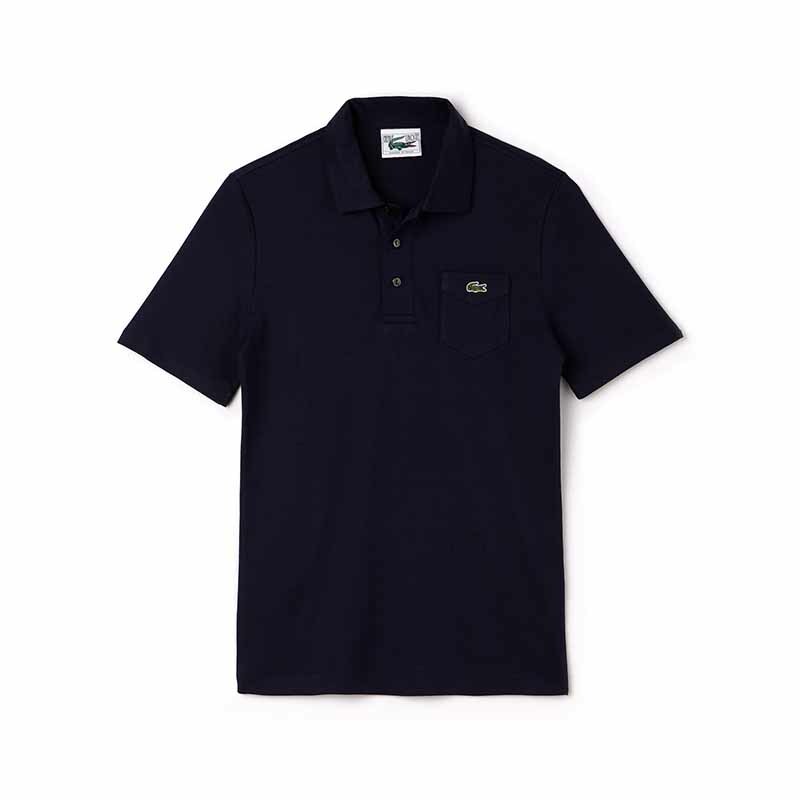 The polo shirt comes in navy blue, green or pale yellow. These two articles are also available in children’s sizes. A nod to the offbeat, colourful style of the nineties, an all-over graphic print reveals the creative “face” of the polo shirt. Bounded by a black line, the energy of a brightly coloured (blue, green or red) swathe contrasts with the pure white of a cotton jersey polo. This colour block design is also used on three cult accessories in piqué coated canvas embossed with the vintage LACOSTE logo: a backpack, a sailor backpack and a belt bag. A straight cut and sporty look for this polo shirt which combines in a modern way the minimalist graphics of a black or deep blue zigzag line with the discrete geometry of a white square piqué knit. 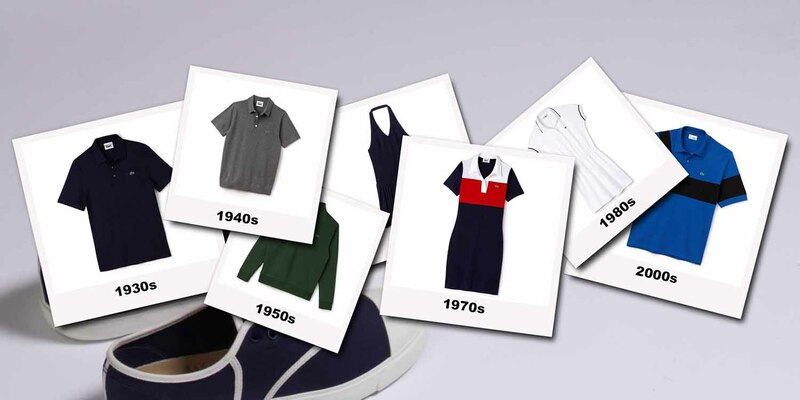 An anniversary collection which proves that fashions come and go but style remains, as exemplified by the L.12.12 polo shirt, created by René Lacoste in 1933, which constantly reinvents itself to claim its place resolutely in the century ahead.